At each SUSTAIN site, the nature of the intervention differs with the unique needs of each community and organisation. We took the time to learn about the initiative “Social and health integration in North Sabadell”. 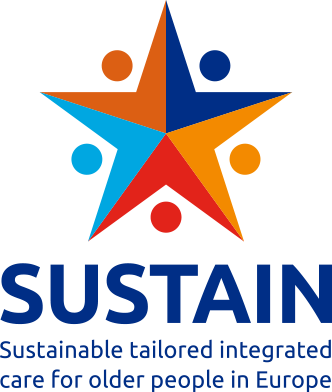 The aim of the SUSTAIN project is to work with local stakeholders to help them improve the services they provide for their frail elderly population. At each SUSTAIN site, the existing model of care is the subject of multi-stakeholder review, leading to the development of a tailored set of improvements to move towards more patient-centred, prevention-oriented, efficient and safe integrated care. In Sabadell, a city of 208,000 inhabitants, located 30 km north of Barcelona, our colleagues from AQuAS – Agència de Qualitat i Avaluació Sanitàries de Catalunya are working with one such initiative, which is focussed on integrating Primary Health Care service with Sabadell City Council’s Basic Social Services for 65+ citizens with complex health care and social needs. The initial SUSTAIN review process identified a number of impediments to effective care, among which low opportunities for inter-professional working, an absence of common procedures and tools to perform joint assessments, and a lack of senior managerial buy-in, e.g. across the three Primary Care Centres and Social Services involved in the initiative were identified as of greatest importance. 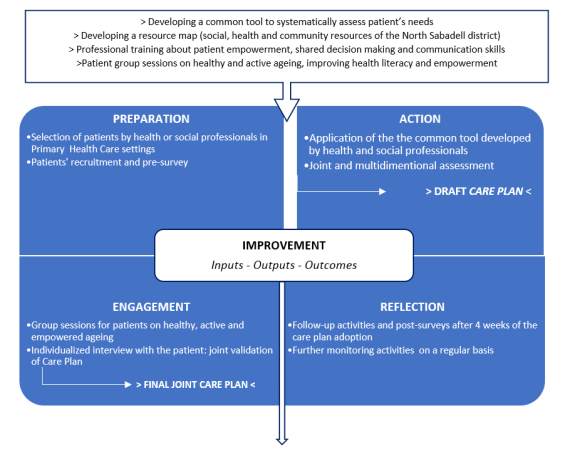 Improving patient empowerment, capabilities of self-managing health and wellbeing by means of group sessions on active and healthy ageing and a greater involvement in community resources available for elderly people. With these three clear goals in mind, and based on a purposively designed SUSTAIN methodology and approach, a comprehensive intervention has been set out to structure the development and implementation of Sabadell’s improvement project. Taking into consideration the different steps, it is possible to identify the four cornerstones of the improvement project which will ‘guide’ the implementation following the preliminary activities: preparation, action, engagement and reflection. Brought together, these four core aspects of the project aim at the overall improvement of inputs, outputs, and outcomes. AQuAS colleagues have interviewed Lidia Palau (GP – CAP Concordia), Mari Carmen Malagón (Social Worker – CAP Nord) and Rafael Rodríguez (nurse – CAP Nord) at a mid-point of the 18-month implementation of the improvement project. 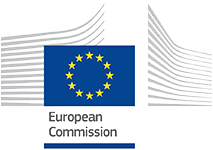 On possible success factors, all three agree that the implication of the members of the steering group who have pushed the project forward is key – “the professionals of the steering group have believed in the project from the very beginning and have led it” (Lidia Palau), but also the fact that it was a small group involved has helped – “since (in each primary care centre) it has just been one nurse, one GP and one social worker, instead of four different GPs with different timetables, it has been easier to arrange” (Mari Carmen Malagón), “but also having SUSTAIN researchers behind us is a form of pressure, that forces us to have things done in the given deadlines” (Rafael Rodríguez). “There is always something with more priority than this coordination (referring to the work on joint assessment, designing care plans and implementing them) […] because participating in this project has been within a usual schedule and in combination with all other workloads. We have done it because we believe in the project and we like it, but it has been an overload […] and more leadership would have helped to establish time slots and deadlines to devote to this project […]. When you (referring to AQuAS researchers) are not around, someone has to do this […] and we have had to assume this ourselves” (Mari Carmen Malagón). “We would need someone to tell us which persons are involved and how the workloads will be managed to make sure it doesn’t all get delayed” (Rafael Rodríguez). “Someone who can say and direct. Another thing is the lack of staff […] we are committed and make an extra effort to ensure the project moves forward, but others may not be so involved and this is a new way of working which requires much more work at the beginning” (Mari Carmen Malagón). When asked on their experience with the improvement project, “My experience is that health and social coordination is key to be able to offer integrated and person-centred care, and this must be embedded in everyday work or it will not be sustainable. Having an implementation plan, and a pilot phase has made a difference, as it has helped us identify aspects to improve and a way to fine tune the general aim we had in the beginning” (Lidia Palau). “Working as an integrated team and seeing the users together really helps more problems to come out as we can talk about everything, and this is when we see the person in all his/her dimensions” (Mari Carmen Malagón). “It allows giving an answer not only to the needs I may consider the person has, but also the needs that the user perceives, and this will make an important improvement in the service we provide to the users” (Lidia Palau). Thinking about a possible impact of the improvement project designed in the frame of SUSTAIN on the way integrated care is delivered in their setting, Lidia Palau mentions: “Up until now (social and health professionals) worked for the patient perhaps more in parallel and only in the light of very specific things we needed from each other. But now it is a way of walking together from the beginning, and this is very enriching. This change of paradigm has become obvious for all of us”. Sabadell’s improvement project includes a series of group sessions on active ageing for elderly patients with chronic conditions. In the first cycle of the improvement project, some practical difficulties in attending all sessions appeared, such as problems in reaching the venue, illness, or not being able to leave a dependent spouse alone. “I think the sessions have been positive all in all. They have given them tools that they previously didn’t know and have been very important in the elaboration of joint care plans, even more than we had imagined. These few sessions have given them a certain level of empowerment and helped them to decide ‘well, yes, these are the care needs I need care for’. In this sense, the coach delivering the sessions was key. From the first day he connected very well with the participants, and, using a specific language and method, has managed to reach them”(Lidia Palau). When inquired about which resources are needed to roll out the improvement project, Lidia, Mari Carmen and Rafael agree that more time of more staff, both from social services and health was needed. “Also administrative support (i.e. for arranging appointments, document management), family workers or volunteers to accompany users to and from the group sessions, and persons from community services to follow up with the activities in care plans related to these services” (Mari Carmen Malagón). “We need support from the managerial level, not (just) in terms of buy-in to the project, but in terms of devoting resources to its implementation”, added Lidia.